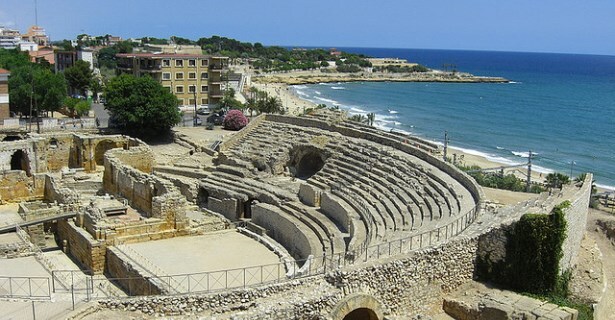 Tarragona lies just south of Barcelona on the northeast coast of Spain. It’s one of the oldest Roman settlements in Catalonia, and its Roman ruins, including the 2nd century amphitheater facing the Mediterranean, have been listed in the UNESCO World Heritage Sites. As Tarragona straddles the Catalan and Valencian borders, it makes for an excellent base from which to explore the region by Tarragona motorhome rental, campervan hire or RV rentals in Spain. After getting your fill of Tarragona’s fascinating mix of Roman past, Mediterranean beach life, and medieval alleyways, drive your RV rental in Tarragona to Salou just 15 minutes to the south. The kids would love the PortAventura Resort, one of the largest theme parks in Europe. The nightlife, too, is abuzz come summer, and a cornucopia of gastronomic delights await the food lover. From Salou, the rice-growing region and ‘paella’ of Valencia is two hours and 15 minutes farther south by camper hire in Tarragona via the less-traveled coast of Costa del Azahar. Make a stop here for the medieval castle of Peniscola and the rocky shores and crystal clear waters that are yet to be overrun by tourism. While not a very popular stop for those rushing to get to Alicante immediately south of Valencia, the countryside of Costa del Azahar is blessed with nature reserves that beg to be hiked, climbed, biked and rafted. Stop your campervan hire in Tarragona wherever the spirit of adventure takes you. If you decide to go north with your campervan hire or RV rentals, your first stop will be Barcelona which is just a little more than an hour up the coast. Barcelona may only be the second largest city in Spain after the capital, Madrid, but it is the economic powerhouse and cultural hub of Spain, and the stronghold of Catalan culture, cuisine and architecture. Don’t forget to drop by in your Tarragona motorhome rental at the birthplace of Antoni Gaudi in Reus, just 20 minutes inland from Tarragona, before you look up at his unfinished masterpiece La Sagrada Familia and other completed works, which you can find in or near Barcelona, that have made it to the UNESCO World Heritage List. Barcelona’s Barri Gotic is itself worthy of exploration on foot, perhaps after you have watched a street performance at the Gothic Quarter or checked out the shops and cafes along the leafy Las Ramblas. Don’t forget Barcelona’s city beaches; this is the Mediterranean after all, so if you need a quick dip, pitch your camper hire in Barceloneta, so you can surf and sun bathe. After the requisite tapas and sangria in Ciutat Vella, head for the rugged and unspoilt coasts of Costa Brava in Girona where you can set up your Tarragona motorhome rental at the best spots for a sweeping view of the Mediterranean. If you are a Surrealism fan, a short drive farther up the coast and close to French border will bring you to Figueres, the birthplace of Salvador Dali.